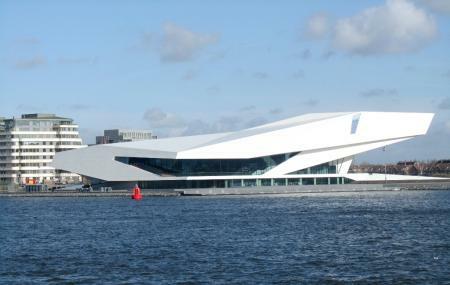 EYE Film Institute Netherlands is one of the most picturesque places that you can visit in Amsterdam. EYE Film Institute Netherlands is a Dutch archive and museum in Amsterdam that takes care of Dutch and foreign films screened in Netherlands and see a lot of tourists all the year round. The architecture of the place makes it a beautiful destination. So take out sometime and visit this destination to indulge in cinema like never before. Take a bus from Amsterdam, Buiksloterwegveer. How popular is Eye Film Institute Netherlands? People normally club together Houseboat Museum and Museum Willet-holthuysen while planning their visit to Eye Film Institute Netherlands. I’ve been to the Eye Film Institute several times and it never disappoints. I’ve been to watch films, I’ve been for lectures and most recently I was there for the remembrance of a filmmaker that I worked with who recently passed. The architecture is incomparable and the atmosphere inspiring. The beautiful view out onto the port and the food is a plus. I dream of seeing one of my films in this place one day. Sit in the Eye Bar at sunset and get a fantastic view over the harbour of Amsterdam. One of the best spots in the city to see the Amsterdam side from afar. The ferry across the harbour from Central Station is free and runs every 5 minutes till late. The Eye Museum itself is also really nice and they show some good none mainstream films too in their cinema. The interactive exhibition and innovative experience the museum offer are something you cannot miss. From the deck outside of the museum, you can also take a decent look at the skyline opposite. The museum cafe is very nice to have a meal at, especially during sunset hours. The museum's focus is on the ever-changing temporary exhibition and the many different (art house) films being shown during the day. So check beforehand whether these are up your alley. The permanent exhibition is very good, but not very extensive. Nice museum with a good restaurant which has a great canal view, and good food.. I also liked the arts shop in the building, you can find really good art pieces there.. Highly recommended..